TCG Anadolu LHD: A Naval Platform that will Multiply the Power Projection Capability of Turkish Navy! On December 5, 2018, President of Defence Industries (SSB) Prof. İsmail DEMİR, with an accompanying delegation, visited the TCG Anadolu Multipurpose Amphibious Assault Ship (LHD), which is currently under construction at Sedef Shipyard in Tuzla. 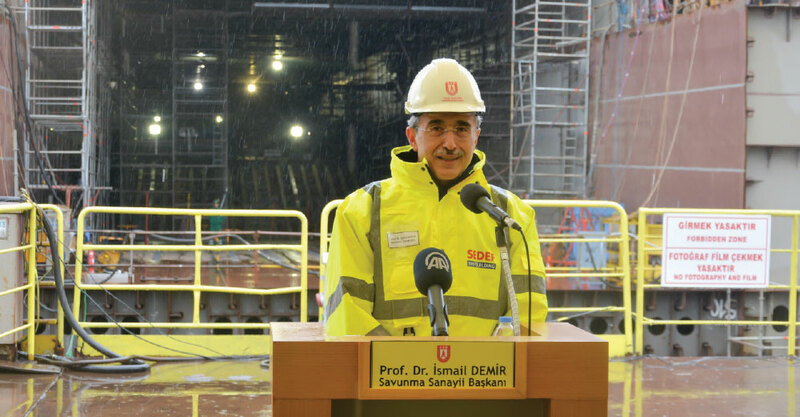 After receiving information about the construction of the ship from Sedef Shipbuilding Inc. CEO Metin KALKAVAN and other company officials, Prof. DEMİR made a statement to the press who gathered for the announcement under intense rain showers and stated that they are here to follow the construction process of TCG Anadolu, the single largest defense industry product of Turkey. Stating that the ship is built block by block like legos and each block is assembled piece by piece under a great undertaking, Prof. DEMİR noted that we will see the fully constructed state of the ship in relatively short period of time. DEMİR also stated that a country sold a vessel similar to the TCG Anadolu to another country in the past years: “This ship cost us almost half the price when you compare the two vessels considering the sale figure of that ship. If we had bought this ship from another country, we would have paid twice as much. In addition, we would miss the chance to use domestic products with a 65-70% rate in the project.” Prof. DEMİR also stated that Turkey will have the opportunity to build and export such a product and will give an important message to the world about the shipbuilding industry. Under the Multipurpose Amphibious Assault Ship (LHD) Project Contract signed on 1 June 2015 between the Presidency of Defense Industries (SSB) and Sedef Shipbuilding Inc.(Sedef Shipyard), “Keel Laying Ceremony” of the TCG Anadolu (L-400), which is planned to be constructed with a 68% domestic contribution rate and temporarily delivered to the Turkish Naval Forces Command (TNFC) in the T0+67th month (April 2021), was held on April 30, 2016 at Sedef Shipyard in Tuzla, İstanbul and the project activities (T0) were started as of 18 September 2015. Following the 12-month warranty period, the final acceptance of TCG Anadolu LHD is scheduled to be completed in the T0+79th month (April 2022). The main Contract for the Multipurpose Amphibious Assault Ship (LHD) Project includes the procurement of one LHD, four Landing Craft Mechanized (LCM, the Navantia design four LCM-1E will be constructed at Sedef Shipyard), two Landing Craft Vehicle Personnel (LCVP), two Rigid-hulled Inflatable Boats (RHIB), and one Commander Boat for guidance purposes. The total cost of the project is expected to be €1,250 Billion. The design, construction, system integration, performance and timely delivery of the TCG Anadolu LHD are under the responsibility of Sedef Shipyard. Although no special training was required for the construction of the ship, a group from the Sedef Shipyard was sent to the Spanish Navantia Shipyard and Sedef Shipyard engineers worked together with Navantia engineers during the design work. Within the scope of the project, a Navantia Office was established at Sedef Shipyard and a special secure (encrypted, no outside access to information) information exchange line was installed. According to the information we received during the visit, as of December 5, 2018, there are 8 Navantia personnel at Sedef Shipyard and they work mainly for coordination and emergency purposes. Sedef Shipyard officials pointed out that there are no problems in the project and said that they hold a live meeting with Navantia Shipyard every week regarding the project work. The TCG Anadolu LHD is designed to operate even in sea state 6 conditions and even the design of the elevators on the ship has been updated and tested according to this requirement. At the request of TNFC, unlike the other sister ships in service, Central Steel Fender, (two rows of parallel steel curtains) will not be located in the well deck of the TCG Anadolu LHD. The ship will consist of 114 blocks, each weighing at least 200 tons; 68 of these were assembled on the cradle and the construction activities of the other 46 were planned to be completed with 24 operations by March 9, 2019. Every three days a new block is laid, a single block or sometimes combined double blocks are assembled on the cradle. 35% of the hull construction has been completed as of December 5, 2018. Internal outfitting activities are carried out in parallel with the hull construction activities, in this context, the installation of 5 main diesel engines into their mounts has been completed. Diesel engines will be removed from their mounts through side opening doors for maintenance and repair. The TCG Anadolu LHD, the construction and block assembly activities of which are still under way in dry dock (310m x 50m x 8.3m in measurement with 180,000DWT -Deadweight Tonnage- capacity), is planned to be launched on March 18 or March 23, 2019. It is planned to start the Setting to Work (STW) process at the end of June 2019 and operate the vessel. 11,900 tons of steel plate will be used in the construction of the ship and 1,000 tons of these plates will be made of ballistic steel. While ballistic steel will be procured from abroad as it is not produced in Turkey, 10,900 tons of steel plate will be supplied from Erdemir Demir Çelik AŞ from Turkey. 4,500 ballast pipes, 454 vertical hatches and 650 panel doors are used in the construction of the ship. There are more than 1,000 enclosed spaces, 11 decks and 9 elevators on board the vessel. The Navantia product Integrated Platform Mangement System (EPKİS/IPMS) onboard the vessel will have 30,000 control and monitoring points. (EPKIS/IPMS used in HMAS Canberra and HMAS Adelaide LHD Ships has 64,000 control and monitoring points while Juan Carlos-I LHD has 50,000 control and monitoring points). Approximately 1,000-1,200 personnel from Sedef Shipyard including 400 engineers work in the construction of the ship. However, with the outsourced workers, an average of 1,400-1,500 people in total work in the construction of the ship in 2 shifts every day. If necessary, the working pace can be planned in three shifts. The TCG Anadolu LHD is a single-hull steel ship, based on a Navantia Shipyard design platform with combat systems integrated by Aselsan-Havelsan Partnership. The TCG Anadolu is based on the Navantia Atlas LHD 26,000 design like the Juan Carlos-I (L-61) in service of the Spanish Navy and the Canberra Class LHDs, HMAS Canberra (L-02) and the HMAS Adelaide (L-01) in the service of the Royal Australian Navy. The vessel is planned to be constructed at 230,8m with a full displacement of 27,436 tons. The TCG Anadolu will feature a 202m long flight deck with 6 landing spots on it and is expected to have a maximum waterline length of 207.2m, a beam of 32m, maximum speed of 20.5 knots (full load displacement), an economical speed of 16 knots and a maximum range of 7,000nm + 2,000nm at economical speed. The LHD will have a total height of 58m with a design draft (the distance from the bottom of the keel to the waterline) of 7,07, the floodable well deck will have a draft of 10,20m and the flight deck of the vessel will have a depth of 27,5m with a total height of 20m from the waterline. The TCG Anadolu, which will transform the regional force projection (transfer) capability of the Turkish Naval Forces Command into a medium-scale global force projection capability, will have an endurance of 30 days and will be able to carry a battalion size amphibious task force (Amphibious Marine Battalion) with its equipment and a total of 94 vehicles (13 ALTAY MBT, 27 Armored Amphibious Attack Vehicles [ZAHA/AAAV], 6 APC and 48 various vehicles). A total of 1,223 personnel will serve onboard the ship, and Land, Air Force, and Amphibious Unit Command & Control Systems including NATO Headquarters Systems to be configured according to operational requirements will be located at the vessel. 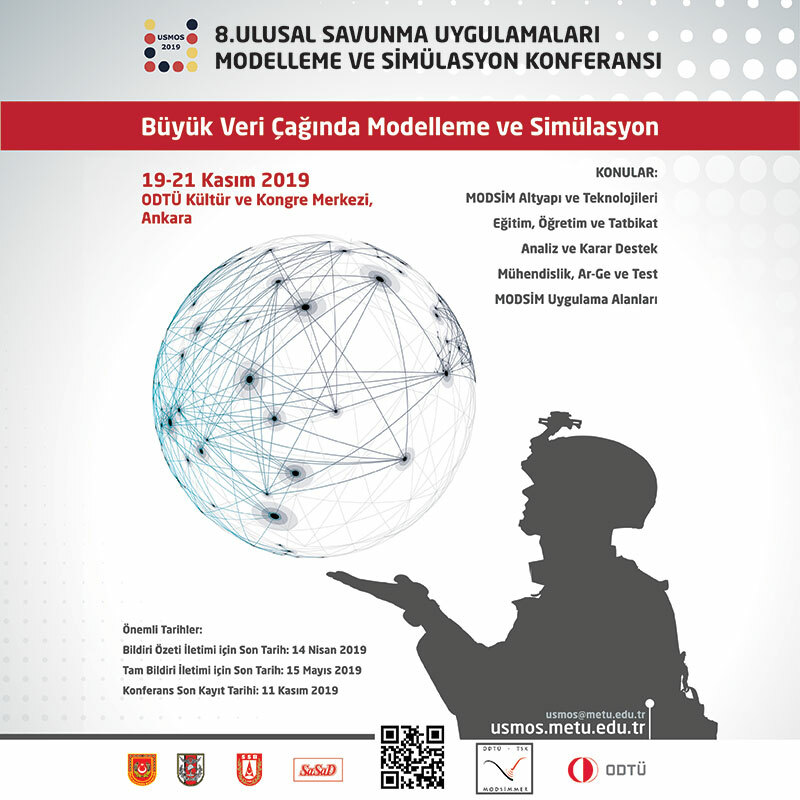 In addition to the Combat Management System network under the Ship Information Systems infrastructure, TSK-Net, Internet, NATO Network, Message Operating System (MIS) and Ship Administrative Local Area Networks will also be available. The TCG Anadolu will have an infirmary/hospital with at least 30 bed capacity including two operating rooms, x-ray devices, dental treatment units, intensive care and isolation rooms, and will also serve as a Hospital Ship in Humanitarian Aid Operations. The vessel will feature a floodable well-deck, which can host four LCM-1E or two Landing Craft Air Cushion (LCACs) with a single tank carrying capacity. In this context, unlike the other three sister ships, the well-deck of the TCG Anadolu will not feature a central steel fender as it will prevent the docking of LCACs. There is no water on the well-deck during the cruise, the deck is flooded before the landing operation via engines after opening the stern door, the deck can also be flooded while the ship is moving. Right next to the well-deck is the Heavy Vehicle Deck. After the mission, the water is discharged again by the pumps/motors and the well-deck becomes dry again. The TCG Anadolu will be equipped with a CODAD (five MAN 16V32/40 Diesel Engines) type Electric Drive/Propulsion System, unlike other sister ships with Electrical Drive/Propulsion System in CODAG (two MAN 16V32/40 Diesel Engines and one LM2500 Gas Turbine) configuration. The Electric Drive/Propulsion System of the vessel with 40,000kW power generation capacity will incorporate two Siemens product eSiPOD propellers each with an 11MW capacity and 360-degree rotation capability and two bow propellers each with a 1,500kW capacity. The classification process of the TCG Anadolu will be carried out by Türk Loydu and unlike the other sister ships, the vessel is designed and constructed with the ability to deploy short take-off vertical landing (STOVL) capable F-35B aircraft from the beginning. In this context, the flight deck and electronic/hardware infrastructure of the ship will be constructed compatible with the F-35B Lightning II. If the TNFC decides to order the F-35B in the future, it will be possible to deploy the aircraft on board the ship without the need for extensive modification. In the Introduction Movie displayed during the Keel Laying Ceremony, the aircraft capacity of the TCG Anadolu (L-400) LHD was stated to be “12 F-35Bs or 30 general purpose helicopters”. 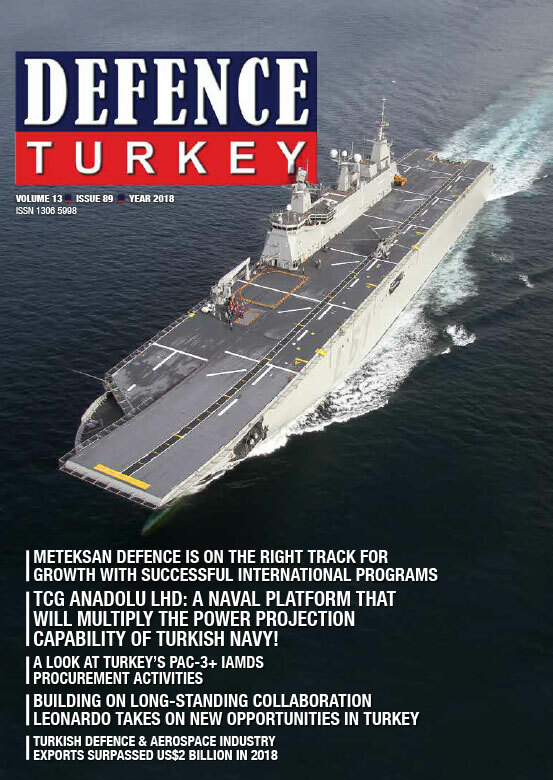 In 2018, It was reported in written and visual media that the Turkish Navy plans to acquire a total of 32 (16 aircraft per ship) F-35Bs to be used onboard the TCG Anadolu and the sister ship the TCG Trakya, the construction activities of which are planned to start in the coming years. Within this scope, following the DIEC/SSIK decision on the subject, the Turkish Navy selected two pilots for F-35B pilot training and planned to send these pilots the USA for F-35B Transition and Instructor Pilot training following the Advanced Jet Training to be carried out at the 2nd Main Jet Base in İzmir Çiğli. As the size and durability of the aircraft elevators located fore and aft of the flight deck are only suitable for the F-35B, large-scale aircraft such as the CH-47F Chinook or the V-22 Osprey are planned to be carried with the stern elevator. Aircraft currently operating in NATO such as the CH-53, CH-47, S-70B, AW149, and the V-22 Osprey, will be able to take-off and land on the TCG Anadolu which is designed and built to participate in NATO missions. Additionally, with the infrastructure to be installed on the ship, repair and maintenance services can also be provided for these aircraft up to a certain level. For many years the Turkish Navy wanted to operate ship-based fixed-wing combat aircraft, which will provide a quantum leap for Naval Aviation, just like the rotary-wing aircraft still being used by Naval Aviators and deploy these aircraft at a permanent base on land and on an LHD type aircraft/helicopter ship during operations. The effectiveness of the Turkish Navy in the Mediterranean and in the seas worldwide, will also increase significantly if Turkish Naval Aviation starts to operate ship/land-based combat aircraft. The Turkish Navy, which has a more advantageous position regarding power projection than the Army and Air Force, can navigate the territorial waters of a country with its surface platforms using the right of innocent passage and transit passage under the UN 1982 Convention on the Law of the Sea without informing or having permission from the official authorities of a country, thus it can display the Turkish flag all over the world. Since warships are considered the land of that country, they are the most suitable platforms for power projection.